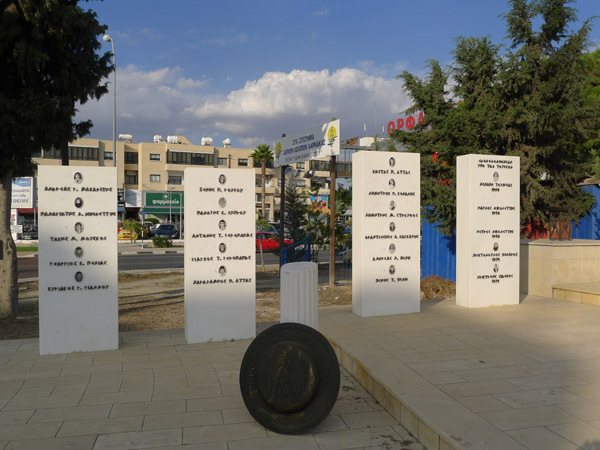 The initiative for the memorial was taken by the community of Kontemenos, currently in the occupied area of Cyprus. 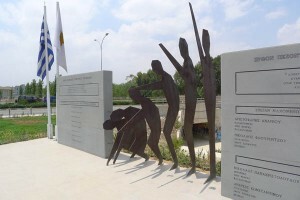 The unveiling took place on June 12th 2011. The falling fighter’s figure, cut in metal plates, imitates the slow motion of a film’s frames. His repeated silhouette composes an eloquent narration which eliminates all the secondary visual items, indispensible and inevitable in a naturalistic composition, thus focusing on the main event: the perishing. The lack of any detail produces an inclusive and symbolic image of actual or metaphorical death. 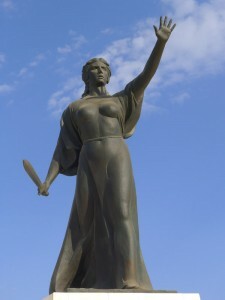 The raised hand alludes to a weapon or, vice-versa, the raised weapon alludes to the familiar spasm of the body that has been shot. This summarizing process adds expressive power to the depicted figure, while the surrounding architecture construction frames it in a plain and clear manner. 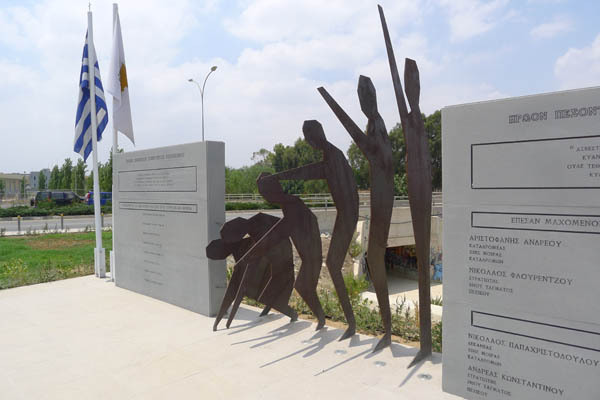 This entry was posted in Inter-communal conflicts 1958, Modern sculpture, Turkish Invasion and tagged Inter-communal conflicts 1958, Lakatamia Municipality (Δήμος Λακατάμιας), Modern Sculpture, Nicosia district (Επαρχία Λευκωσίας) on by admin. 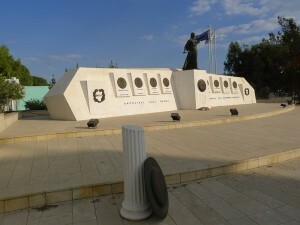 Location: General Timayia Avenue, Larnaka. Larnaka district. 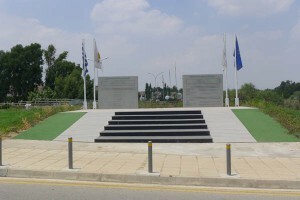 The memorial was commissioned by Lysi community. 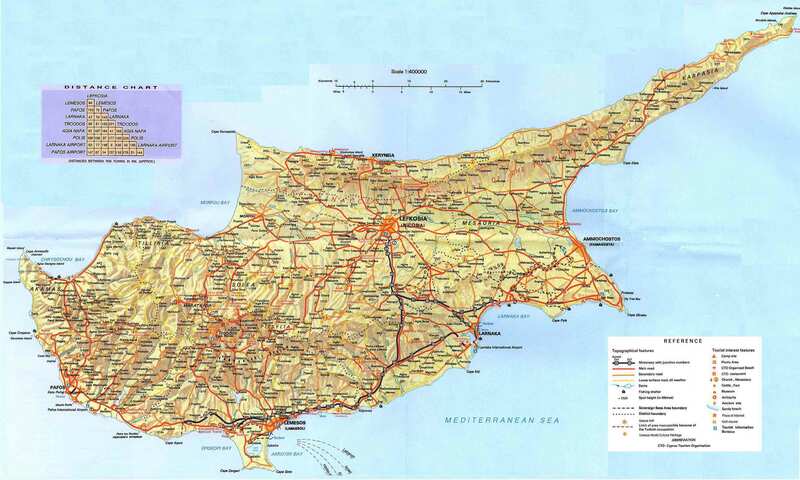 Although Lysi village is situated in the occupied part of Cyprus, its’ authorities are regularly elected by their ex-inhabitants in the free part of the island. The same policy is applied to all the occupied municipalities and communities. The memorial was initially dedicated to eight EOKA 1955-59 dead and the initial unveiling took place in September 6th 1996. In 2000 the memorial was reformed and it was extended physically: The initial construction consisted of the (current) central part with the marble platform and the standing female militant figure on top. 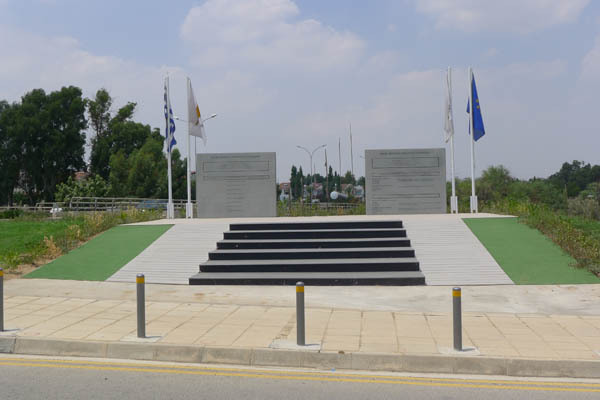 In 2000 nine stele in total were added on the left and right hand site with the names of dead and missing Lysi fighters during the inter-communal conflicts of 1958 and the Turkish invasion. The second unveiling of the current memorial took place on September 8th 2011 and is now dedicated to thirty four dead and missing fighters. ~Αγών (Agon), September 8, 1996. ~Αλήθεια (Alithia), December 7, 1989. ~Σημερινή (Simerini), January 1, 1992. ~Κρατικό Αρχείο Κύπρου, Αρχείο Πολιτιστικών Υπηρεσιών Υπουργείου Παιδείας & Πολιτισμού (State Archive of Cyprus): 268/1968/11, no 694/93. 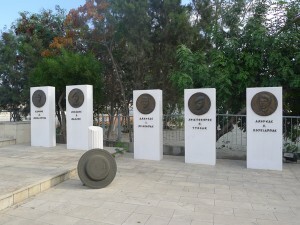 This entry was posted in EOKA 1955-59, Inter-communal conflicts 1958, Turkish Invasion and tagged EOKA 1955-59, Inter-communal conflicts 1958, Kontovourkis Kyriakos (Κοντοβούρκης Κυριάκος), Kotziamanis Nikolaos (Κοτζιαμάνης Νικόλαος), Larnaka district (Επαρχία Λάρνακας), Larnaka Municipality (Δήμος Λάρνακας) on by admin.